For me it was love at first sight, touch, smell and taste! Provence is like nowhere else on Earth. Driving through the old winding roads I am surrounded by sun drenched softly undulating hills, legions of vines and lavender planted in regimented lines broken only by a rocky outcrop or dusty track. The clear blue fire of the day is broken only when plunging into the cool relief of the dark corridors of Planes in leaf. With the windows open I am rewarded with the soft subtle perfume of everything that grows here; Thyme, Rosemary, Sage and Lavender grow wild amongst the garrigue, twisted and stunted by the unique and unforgiving climate but so sweetly scented. The clear air and intense luminance of the Provencal sunshine holds the landscape in crystalline precision, distant hills appear closer, rendered in the most amazing detail. Every time I come back I love to just get lost, surrendering to the spirit of the land and letting her guide my way. My route is dictated by whatever catches my eye and curiosity as to what’s round the next bend; I stop to explore old dry stone terraces that step down the steep hill side. An enticing view partially hidden by the grove of ancient Olives lures me through their gnarled and twisted branches, their leaves shimmering silver to green in the warm aromatic breeze. I could stay in this magical place all day. Wandering down into the scrub-like woodland consisting mainly of Downy Oak and Box, interspersed with shrubs and flowers including Rock Roses, Star of Bethlehem, Wild Jasmine, Dwarf Toadflax and if I’m lucky a wild Peony or two, I sense the unseen rhythm of the landscape. It’s in perfect balance with itself. Setting my course toward Mount Ventoux I wind my way up through the beautiful valleys, stunning white cliffs break through the mixed scrub woodland which gives way to more pines as I ascend. During one of my favourite drives I arrive at the lovely little village of Aurel and take a seat outside the Relais du Mont Ventoux (a great little bar and restaurant) to enjoy a cold beer, a bite to eat and the most fantastic views. The landscape is dramatic, nearly vertical gorges, calm mountain lakes and valleys so deep and narrow they have their own climates, Haute Provence is breathtakingly beautiful. This is where the mellow vine; olive and lavender covered hills give way to abrupt and challenging Alpine landscapes. 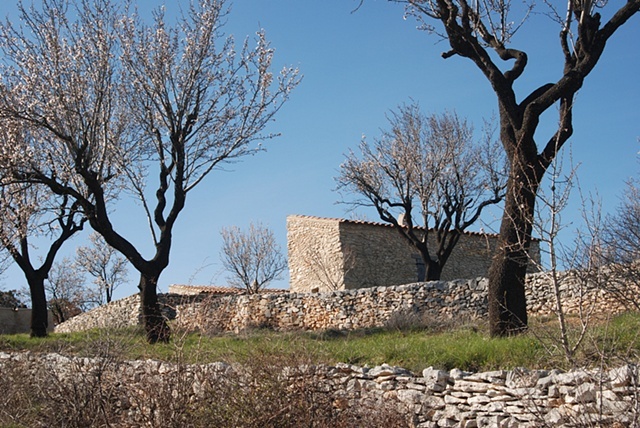 Almond trees grow happily in the stony, chalky soil of the sunny terraced foothills of Mont-Ventoux which climbs to over 6000 feet. There is no clear line of demarcation. Instead, the landscape folds back and forth upon itself, seeming to suggest the giant tectonic forces that created the Alps. One moment you will be staring up at arid, deeply eroded limestone peaks, hot and almost lifeless, some of the least populated areas in France. The next moment turning a corner you could face a rapid descent to the floor of a gorge only six metres wide, so damp and cool that water seems to seep out of its moss-covered walls. Haute Provence, one of my favourite places in the world.